Download "TRAFFIC SAFETY FACTS. Alcohol-Impaired Driving. 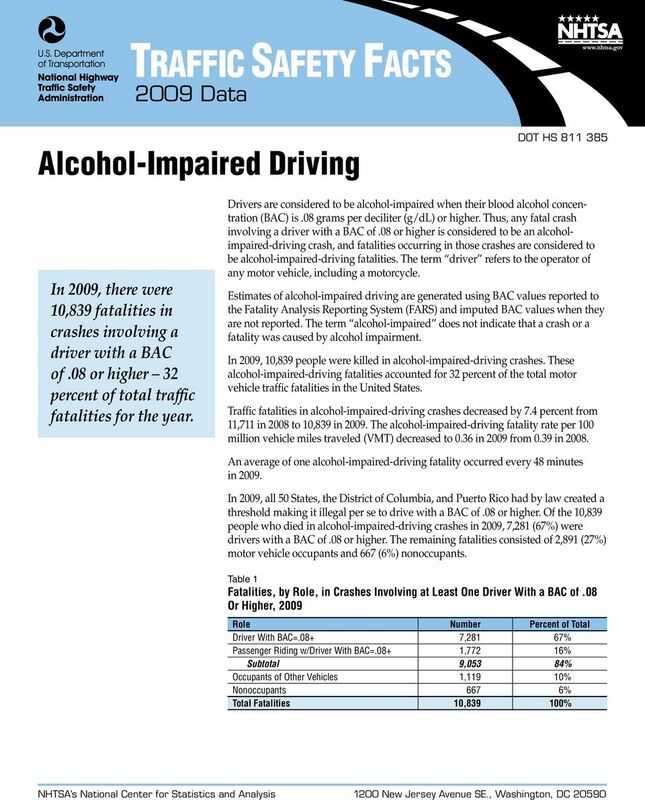 2009 Data"
2 2 Figure 1 Fatalities and Fatality Rate per 100 Million VMT in Alcohol-Impaired-Driving Crashes, ,000 Fatalities Fatality Rate per 100 M VMT , , , The national rate of alcohol-impaired-driving fatalities in motor vehicle crashes in 2009 was 0.36 per 100 million VMT. 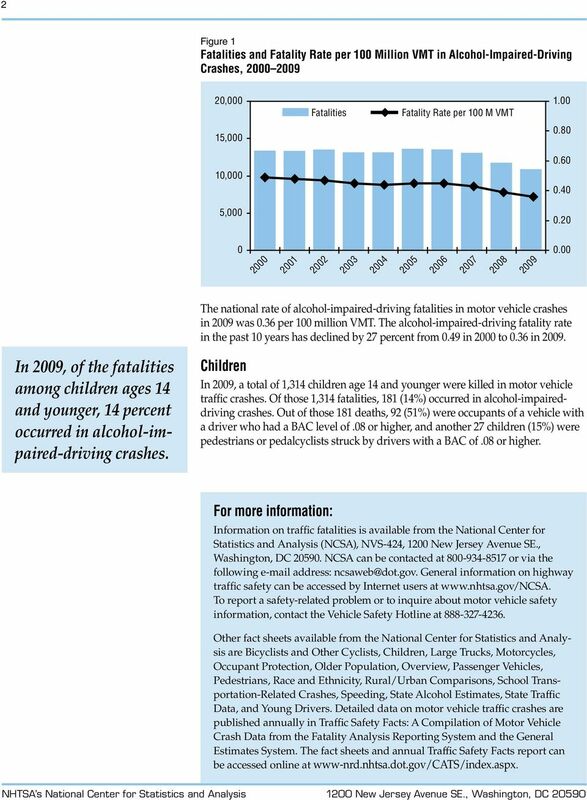 The alcohol-impaired-driving fatality rate in the past 10 years has declined by 27 percent from 0.49 in 2000 to 0.36 in In 2009, of the fatalities among children ages 14 and younger, 14 percent occurred in alcohol-impaired-driving crashes. Children In 2009, a total of 1,314 children age 14 and younger were killed in motor vehicle traffic crashes. Of those 1,314 fatalities, 181 (14%) occurred in alcohol-impaireddriving crashes. Out of those 181 deaths, 92 (51%) were occupants of a vehicle with a driver who had a BAC level of.08 or higher, and another 27 children (15%) were pedestrians or pedalcyclists struck by drivers with a BAC of.08 or higher. For more information: Information on traffic fatalities is available from the National Center for Statistics and Analysis (NCSA), NVS-424, 1200 New Jersey Avenue SE., Washington, DC NCSA can be contacted at or via the following address: General information on highway traffic safety can be accessed by Internet users at To report a safety-related problem or to inquire about motor vehicle safety information, contact the Vehicle Safety Hotline at Other fact sheets available from the National Center for Statistics and Analysis are Bicyclists and Other Cyclists, Children, Large Trucks, Motorcycles, Occupant Protection, Older Population, Overview, Passenger Vehicles, Pedestrians, Race and Ethnicity, Rural/Urban Comparisons, School Transportation-Related Crashes, Speeding, State Alcohol Estimates, State Traffic Data, and Young Drivers. Detailed data on motor vehicle traffic crashes are published annually in Traffic Safety Facts: A Compilation of Motor Vehicle Crash Data from the Fatality Analysis Reporting System and the General Estimates System. The fact sheets and annual Traffic Safety Facts report can be accessed online at www-nrd.nhtsa.dot.gov/cats/index.aspx. 3 3 Time of Day and Day of Week The rate of alcohol impairment among drivers involved in fatal crashes in 2009 was four times higher at night than during the day (37% versus 9%). In 2009, 16 percent of all drivers involved in fatal crashes during the week were alcohol-impaired, compared to 31 percent on weekends. 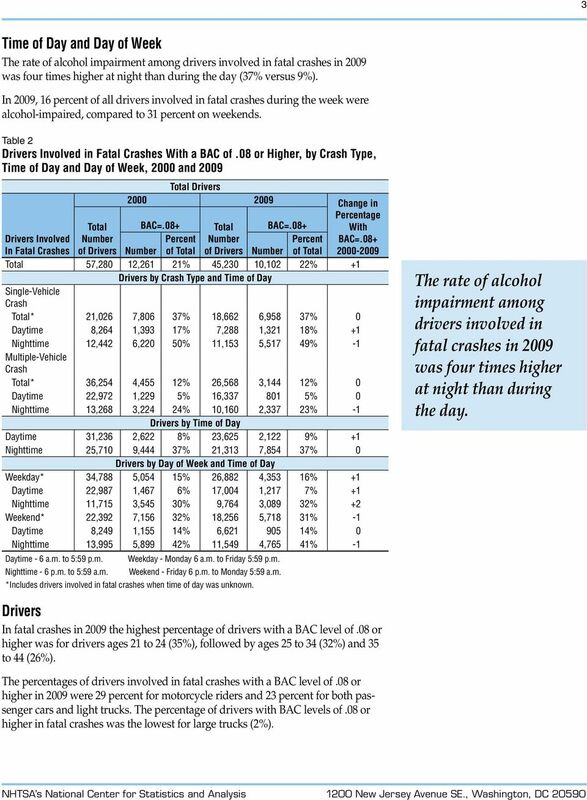 Table 2 Drivers Involved in Fatal Crashes With a BAC of.08 or Higher, by Crash Type, Time of Day and Day of Week, 2000 and 2009 Total Number of Drivers Total Drivers Change in Percentage BAC=.08+ Total BAC=.08+ With Percent Number Percent BAC=.08+ Number of Total of Drivers Number of Total Drivers Involved In Fatal Crashes Total 57,280 12,261 21% 45,230 10,102 22% +1 Drivers by Crash Type and Time of Day Single-Vehicle Crash Total* 21,026 7,806 37% 18,662 6,958 37% 0 Daytime 8,264 1,393 17% 7,288 1,321 18% +1 Nighttime 12,442 6,220 50% 11,153 5,517 49% -1 Multiple-Vehicle Crash Total* 36,254 4,455 12% 26,568 3,144 12% 0 Daytime 22,972 1,229 5% 16, % 0 Nighttime 13,268 3,224 24% 10,160 2,337 23% -1 Drivers by Time of Day Daytime 31,236 2,622 8% 23,625 2,122 9% +1 Nighttime 25,710 9,444 37% 21,313 7,854 37% 0 Drivers by Day of Week and Time of Day Weekday* 34,788 5,054 15% 26,882 4,353 16% +1 Daytime 22,987 1,467 6% 17,004 1,217 7% +1 Nighttime 11,715 3,545 30% 9,764 3,089 32% +2 Weekend* 22,392 7,156 32% 18,256 5,718 31% -1 Daytime 8,249 1,155 14% 6, % 0 Nighttime 13,995 5,899 42% 11,549 4,765 41% -1 Daytime - 6 a.m. to 5:59 p.m. Weekday - Monday 6 a.m. to Friday 5:59 p.m. Nighttime - 6 p.m. to 5:59 a.m. Weekend - Friday 6 p.m. to Monday 5:59 a.m. *Includes drivers involved in fatal crashes when time of day was unknown. The rate of alcohol impairment among drivers involved in fatal crashes in 2009 was four times higher at night than during the day. Drivers In fatal crashes in 2009 the highest percentage of drivers with a BAC level of.08 or higher was for drivers ages 21 to 24 (35%), followed by ages 25 to 34 (32%) and 35 to 44 (26%). The percentages of drivers involved in fatal crashes with a BAC level of.08 or higher in 2009 were 29 percent for motorcycle riders and 23 percent for both passenger cars and light trucks. The percentage of drivers with BAC levels of.08 or higher in fatal crashes was the lowest for large trucks (2%). 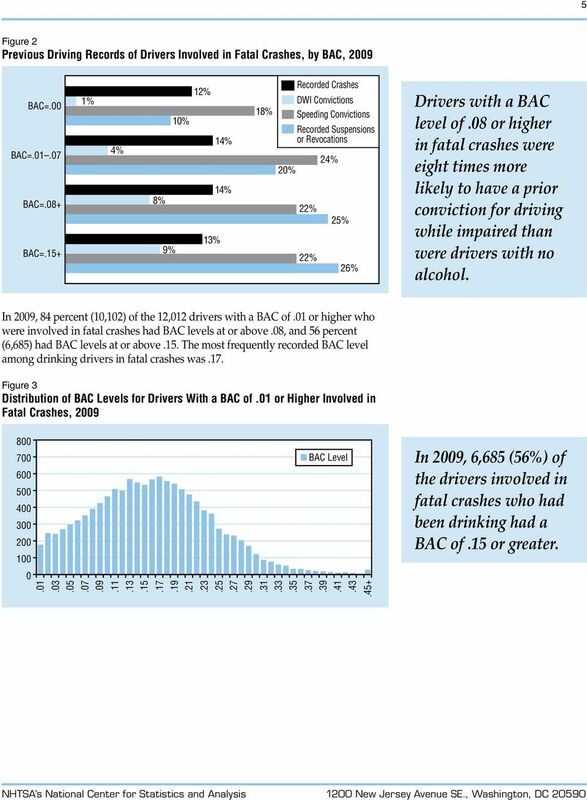 4 4 In 2009, the 21- to 24-year-old age group had the highest percentage of drivers in fatal crashes with BAC levels of.08 or higher 35 percent. In 2009, the percentage of drivers with BAC of.08 or above in fatal crashes was highest for motorcycle riders (29%). 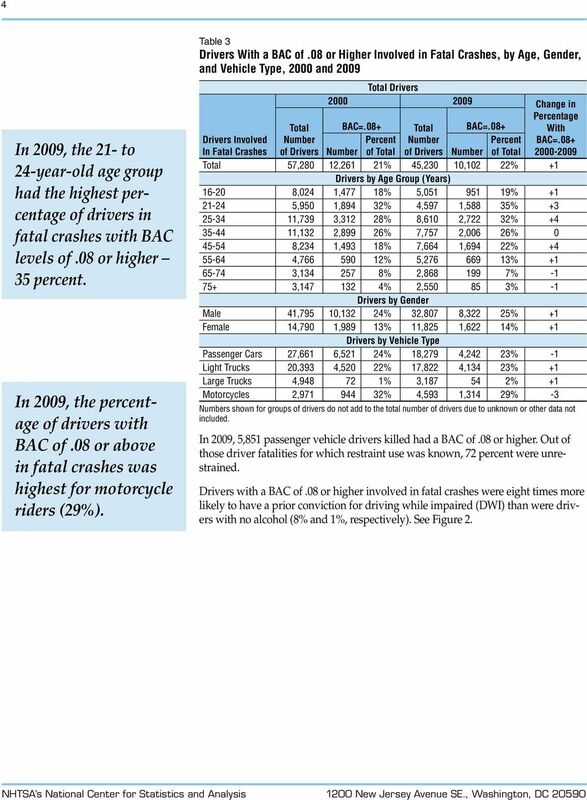 Table 3 Drivers With a BAC of.08 or Higher Involved in Fatal Crashes, by Age, Gender, and Vehicle Type, 2000 and 2009 Total Number of Drivers Total Drivers Change in Percentage BAC=.08+ Total BAC=.08+ With Percent Number Percent BAC=.08+ Number of Total of Drivers Number of Total Drivers Involved In Fatal Crashes Total 57,280 12,261 21% 45,230 10,102 22% +1 Drivers by Age Group (Years) ,024 1,477 18% 5, % ,950 1,894 32% 4,597 1,588 35% ,739 3,312 28% 8,610 2,722 32% ,132 2,899 26% 7,757 2,006 26% ,234 1,493 18% 7,664 1,694 22% , % 5, % , % 2, % , % 2, % -1 Drivers by Gender Male 41,795 10,132 24% 32,807 8,322 25% +1 Female 14,790 1,989 13% 11,825 1,622 14% +1 Drivers by Vehicle Type Passenger Cars 27,661 6,521 24% 18,279 4,242 23% -1 Light Trucks 20,393 4,520 22% 17,822 4,134 23% +1 Large Trucks 4, % 3, % +1 Motorcycles 2, % 4,593 1,314 29% -3 Numbers shown for groups of drivers do not add to the total number of drivers due to unknown or other data not included. In 2009, 5,851 passenger vehicle drivers killed had a BAC of.08 or higher. Out of those driver fatalities for which restraint use was known, 72 percent were unrestrained. Drivers with a BAC of.08 or higher involved in fatal crashes were eight times more likely to have a prior conviction for driving while impaired (DWI) than were drivers with no alcohol (8% and 1%, respectively). See Figure 2. 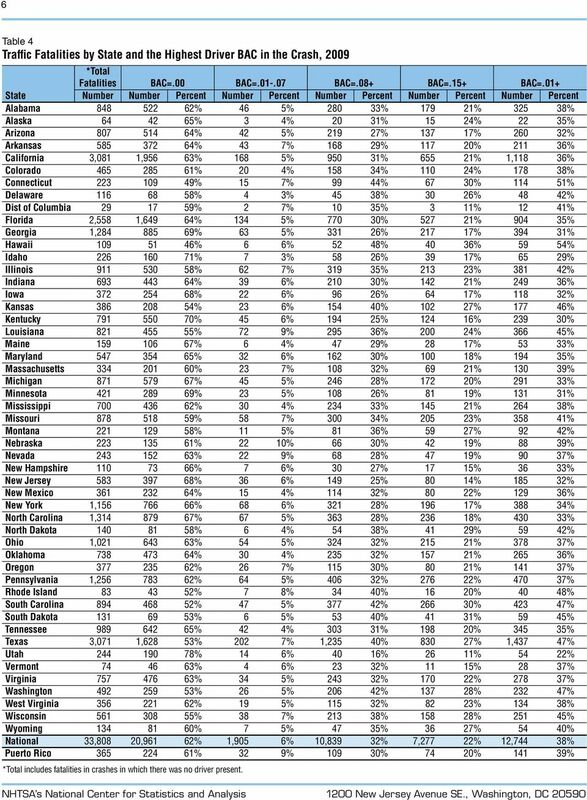 6 6 Table 4 Traffic Fatalities by State and the Highest Driver BAC in the Crash, 2009 *Total Fatalities BAC=.00 BAC= BAC=.08+ BAC=.15+ BAC=.01+ State Number Number Percent Number Percent Number Percent Number Percent Number Percent Alabama % 46 5% % % % Alaska % 3 4% 20 31% 15 24% 22 35% Arizona % 42 5% % % % Arkansas % 43 7% % % % California 3,081 1,956 63% 168 5% % % 1,118 36% Colorado % 20 4% % % % Connecticut % 15 7% 99 44% 67 30% % Delaware % 4 3% 45 38% 30 26% 48 42% Dist of Columbia % 2 7% 10 35% 3 11% 12 41% Florida 2,558 1,649 64% 134 5% % % % Georgia 1, % 63 5% % % % Hawaii % 6 6% 52 48% 40 36% 59 54% Idaho % 7 3% 58 26% 39 17% 65 29% Illinois % 62 7% % % % Indiana % 39 6% % % % Iowa % 22 6% 96 26% 64 17% % Kansas % 23 6% % % % Kentucky % 45 6% % % % Louisiana % 72 9% % % % Maine % 6 4% 47 29% 28 17% 53 33% Maryland % 32 6% % % % Massachusetts % 23 7% % 69 21% % Michigan % 45 5% % % % Minnesota % 23 5% % 81 19% % Mississippi % 30 4% % % % Missouri % 58 7% % % % Montana % 11 5% 81 36% 59 27% 92 42% Nebraska % 22 10% 66 30% 42 19% 88 39% Nevada % 22 9% 68 28% 47 19% 90 37% New Hampshire % 7 6% 30 27% 17 15% 36 33% New Jersey % 36 6% % 80 14% % New Mexico % 15 4% % 80 22% % New York 1, % 68 6% % % % North Carolina 1, % 67 5% % % % North Dakota % 6 4% 54 38% 41 29% 59 42% Ohio 1, % 54 5% % % % Oklahoma % 30 4% % % % Oregon % 26 7% % 80 21% % Pennsylvania 1, % 64 5% % % % Rhode Island % 7 8% 34 40% 16 20% 40 48% South Carolina % 47 5% % % % South Dakota % 6 5% 53 40% 41 31% 59 45% Tennessee % 42 4% % % % Texas 3,071 1,628 53% 202 7% 1,235 40% % 1,437 47% Utah % 14 6% 40 16% 26 11% 54 22% Vermont % 4 6% 23 32% 11 15% 28 37% Virginia % 34 5% % % % Washington % 26 5% % % % West Virginia % 19 5% % 82 23% % Wisconsin % 38 7% % % % Wyoming % 7 5% 47 35% 36 27% 54 40% National 33,808 20,961 62% 1,905 6% 10,839 32% 7,277 22% 12,744 38% Puerto Rico % 32 9% % 74 20% % *Total includes fatalities in crashes in which there was no driver present. TRAFFIC SAFETY FACTS 2011 Data DOT HS 811 767 May 2013 Children In 2011, there were 61 million children age 14 and younger in the United States, 20 percent of the total U.S. resident population in 2011. TRAFFIC SAFETY FACTS. Children Data. Motor vehicle crashes are the leading cause of death for children from 3 to 14 years old.